Children’s Treatment Network (CTN) serves 7,000 children and youth with special needs in York Region and Simcoe County, and is funded by the Ministry of Children and Youth Services. They work with partners in healthcare, education, and community agencies to provide physiotherapy, occupational therapy and communication support for clients that use technology to help them talk. In addition to these rehabilitation services, CTN also provides service coordination, intake and developmental assessments for children with complex medical and developmental needs. Their clients are often diagnosed with autism, Down syndrome, cerebral palsy, spina bifida, genetic disorders, and other conditions that require ongoing support throughout all aspects of life. The spectrum of services provided by CTN helps support families where they need it most – at home, at school, and in the community. “On behalf of Children’s Treatment Network (CTN), thank you Closing the Gap for your generous donation of $1,000 towards the Holiday events. 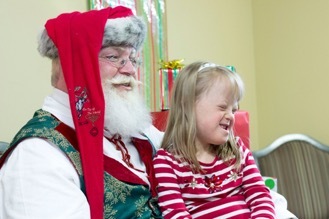 Your donation allowed us to hire a Santa Claus for our Holiday parties in both Orillia and Barrie. Both parties are becoming more successful each year. We had approximately 30 children and caregivers attend in Orillia and 40 children and caregivers attend in Barrie. Both events had eleven volunteers supporting Christmas crafts, cookie decorating, sensory play activities and photos with Santa. Scholar’s Choice was kind enough to attend both parties and provide a sensory activity that was a big success. One of our ongoing challenges is managing the impact of having the same budget year-over-year, while providing services for growing numbers of children and families. Donations like the one provided by CTG are crucial as we continue to provide families with services and support, such as family events.